^ From the roots until today's achievements... Federation of the Swiss Watch Industry. [2007-12-06]. 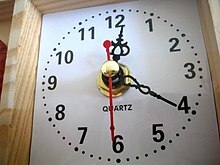 ^ 3.0 3.1 The Quartz Crisis and Recovery of Swiss Watches | Relation between Timepieces and Society. THE SEIKO MUSEUM. [2019-03-03] （英语）. ^ October 10, Joe Thompson; 2017. Four Revolutions: Part 1: A Concise History Of The Quartz Revolution. HODINKEE. [2019-03-03] （英语）. ^ A Tale Of Quartz | The Quartz Crisis and Revolution. Govberg Jewelers. 2015-07-08 [2019-03-03] （美国英语）. ^ The Quartz Crisis. Crown & Caliber Blog. 2018-04-12 [2019-03-03] （美国英语）.